E1 Electrosurgery/cutting unit comes with 7 piece variety electrodes set, 1 hand piece, 1 indifferent or grounding plate, 1power cord, AND 1 foot switch. Operation mode of cut, coagulation, cut-coagulation. Operation frequency is at 1.7 MHZ. 10 different power settings. Unit is a monopolar mode but bipolar converter is optional and available upon request. Electrodes are autoclavable, 1/16" diameter shaft. 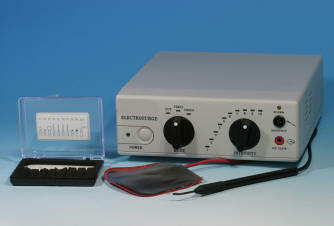 Made universal to other major electrosurgical brands. Ideal for human (dental and dermatology use) and veterinary field.